Whether it develops in childhood or adulthood, living with the symptoms of rosacea can be uncomfortable if left untreated. Estimated to affect more than 16 million adults, rosacea is a common condition which features an appearance similar to that of acne, skin rash, and other types of skin conditions. The Gainesville dermatologists with Gainesville Dermatology & Skin Surgery develop personalized solutions for patients who require dermatological treatment, including dermatology surgery, for any type of skin condition. Contact our office today to find out how our skin care services can benefit you. 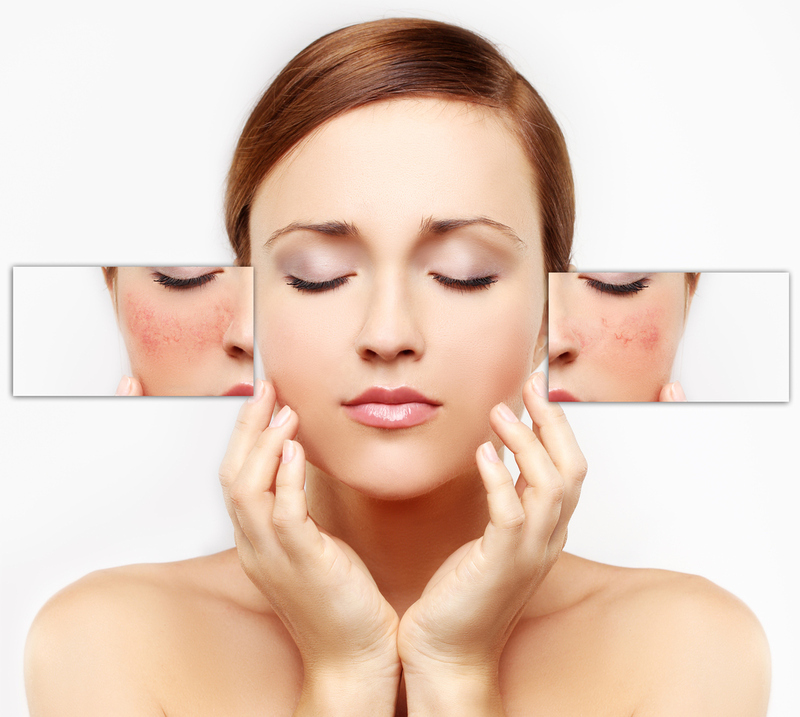 Rosacea is a chronic, inflammatory skin condition that most commonly affects the face. This condition is often misdiagnosed as a number of other skin conditions, such as acne, eczema, and skin allergy. According to the National Rosacea Society, rosacea is more common among individuals who have fair skin as well as those who easily blush or become flushed — it affects more than 16 million individuals in the United States of America. Without proper treatment, the symptoms associated with rosacea may become more severe over time and lead to physical discomfort and emotional issues. This common, chronic, and inflammatory skin condition often begins as a tendency for the facial skin to become flushed. Over time, persistent areas of redness develop on the chin, cheeks, forehead, nose, and neck. Tiny blood vessels may be visible within the affected skin. Individuals with rosacea often report experiencing sensitive, dry, rough and swollen skin, with symptoms varying widely in severity. Approximately, half of the rosacea sufferers also experience rosacea within the eye region — ocular rosacea — which causes red and watery eyes with frequent styles and an irritated or gritty sensation. Though rosacea exists in many forms, the most common types of rosacea occur in four distinct categories — Erythematotelangiectatic Rosacea, Papulopustular Rosacea, Phymatous Rosacea, and Ocular Rosacea. For more information about dermatology conditions treated at Gainesville Dermatology & Skin Surgery, contact us today. This form of rosacea is rare among patients, in comparison with more common forms of the skin condition. Phymatous rosacea causes the skin to thicken and it appears as bumpy, irritated skin and results in the visual enlargement of the affected area and produces a bulbous appearance. In addition, small facial blood vessels are visible. The most common region of skin affected is the nose — rhinophyma — but the chin, forehead, and cheeks may also become affected. This form of rosacea is characterized most commonly by central flushing, redness, and swelling of the nose, cheeks, chin, and forehead, in addition to other parts of the face, accompanied by sensations of burning, stinging, itching, and swelling. Erythematotelangiectatic rosacea may also cause the development and the visibility of small broken blood vessels throughout the facial skin, resulting in skin that is both sensitive and easily irritated. Papulopustular rosacea is the classic presentation of this skin condition. This form of rosacea is characterized by persistent redness to central parts of the face as well as red bumps and pustules or papules which develop and dissipate over time. Oftentimes, this type of rosacea is misdiagnosed as adult acne — however, no blackheads or whiteheads are present. Symptoms include visible pigmentation, swelling, and facial blood vessels as well as facial flushing. Ocular rosacea is characterized by irritated eyes and eyelids which appear bloodshot and which produce a high amount of moisture. This condition often causes a gritty sensation within the eye and styes or conjunctivitis may occur. Oftentimes, facial skin rosacea occurs before ocular rosacea develops — some patients have both skin and ocular rosacea at the same time. Symptoms include dryness, tearing, stinging, sensitivity to light, and, in some patients, blurred vision. Despite the vast amount of research regarding the primary sources of rosacea, the exact causes of rosacea are unknown. However, a number of correlative symptoms and conditions are commonly believed to trigger the development of rosacea, which include a faulty immune system, impaired skin-barrier function, genetic predisposition, and abnormalities within the nervous system. Triggers of rosacea can easily be identified. Any individual may develop rosacea. However, rosacea most often affects people who are 30 to 50 years old; those with fair-skin; women; those with a family history of rosacea; and individuals who experience extremely sensitive skin. Symptoms of rosacea vary for every individual with rosacea. According to Gainesville dermatology experts at Gainesville Dermatology & Skin Surgery, these are four of the most common symptoms experienced by patients who have moderate to severe rosacea. Flushing episodes cause face on the skin to turn bright red or pink and can last for up to 10 minutes before calming. Flushing can spread from the face down to the neck and chest. Individuals who experience flushing report skin feeling hot and tender during episodes. Rosacea symptoms of eye irritation include bloodshot eyes, gritty sensation and burning in the eyes. The inside of the eyelids can become inflamed and appear scaly. Severe forms of rosacea can result in thickening of the skin in areas surrounding the nose, causing the nose to swell. Individuals with rosacea often notice small spots, papules, and pustules on the face — this is also known as inflammatory rosacea. These swollen red bumps are often misdiagnosed as acne. However, skin with rosacea is free of blackheads, unlike that of skin with acne. Sometimes mistaken for sensitive skin, those with rosacea often experience dilating of sensitive blood vessels due to touch or triggers, such as sunlight exposure. While sensitive skin is caused by sensitive skin cells, rosacea symptoms are caused by sensitive blood vessels. Rosacea is marked by intermittent flare-ups caused by environmental triggers. These triggers increase the blood flow to the skin’s surface and make daily life uncomfortable. Our Gainesville dermatologists can help identify which triggers aggravate your rosacea. Consuming hot drinks and spicy foods can easily trigger flare-ups of rosacea, and these triggers may cause the development of rosacea severity if experienced frequently over time. Steer clear of foods with high levels of spice and beverages of high temperatures, specifically throughout the warm seasons — throughout most of the year in for Florida residents. Patients with rosacea often report that their symptoms become exacerbated following spending time outside. To avoid facial redness, flushing, and irritation to the rosacea flare-up prone skin wear a broad-brimmed hat, protective clothing and SPF of at least 35 each day to protect the skin from the sun and the heat. In addition, avoid taking hot baths or using saunas. Persistent stress and anxiety can easily trigger any number of rosacea symptoms, including redness, swelling, irritation, and other factors commonly associated with flare-ups. While everyone encounters moments of stress and anxiety, keep in mind that frequent stress and anxiety may cause rosacea of a moderate degree to develop into a more severe degree. If left untreated, rosacea may slowly become worse over time, possibly resulting in permanent skin damage and long-term ocular irregularities. Over-the-counter treatments available to help ease symptoms of rosacea which can help patients who suffer from rosacea get their skin condition under control and minimize the effects of rosacea. Prescribed treatments provided by a dermatologist in Gainesville include the following. End rosacea and other vascular imperfections with VBeam® laser. Treatments are safe, non-invasive, and effective for reducing the appearance of facial redness and red patches of skin caused by rosacea. What’s more, this treatment only requires minutes to complete. Sun protection is essential 365 days each year. Most individuals who have rosacea report immediate and lasting rosacea flare-ups with exposure to sunlight. Even those who treat facial redness still require a dermatologist-approved formula with a sun protection factor of at least 35. Calming creams and lotions, which are specially formulated to help reduce inflammation and redness of the skin caused rosacea flare-ups, may also be prescribed during treatment. These medications may work for up to 12 hours each day with daily application. A Gainesville dermatologist with our practice will help you create a guideline for reducing the frequency of flare-ups and the duration of rosacea symptoms. Our team can also provide patients with skin care products and recommendations for rosacea-approved formulations.